Is it worth simplifying/eliminating/consolidating a big chunk of the F# compiler code by replacing most of the AbsIL code with the System.Reflection.Metadata library? That’s the library used by Roslyn to read/write .NET assemblies; switching over to using that library would more closely align the F# compiler with the Roslyn compilers and reduce the amount of code we need to manage/maintain in the F# compiler. It’s also been well-optimized so may provide some performance benefits during compilation. If there’s interest in this from the F# compiler team (e.g. @dsyme or @KevinRansom), I’m willing to take a shot at prototyping it. We know that the F# language design and core implementation is sufficiently independent that it allows things like Fable to achieve viable lift-off from a technical perspective. We should keep it that way. (2) means there are a major long-term advantages to having the F# compiler be an all-F# program: it helps maintain the technical independence of F# from the .NET runtime. This is at the cost of actually implementing the binary reader/writer in the first place, but that cost is paid. (2) also implies that I'm generally not in favor of FSharp.Compiler.Service.dll picking up any new dependencies on C#-implemented libraries, ever. For things like emitting debug symbols it is less contentious, and we did pick up a new dependency there (though again I would generally prefer not to). The advantage of moving over to libraries shared with Roslyn are that we can leverage more of the Roslyn team for work. The disadvantage is that if we manage it ourselves we can leverage more of the F# Open Source community. We have gained enormous benefits from the work of the community and the flexibility that offers them in implementing new things. I think we should continue that way ... leveraging Roslyn when it makes sense but otherwise, continue to plough our own furrow. Say that, prior to Fable being created, we deferred to S.R.M. for reading/writing IL. Would that have prevented Fable from being developed in the first place? Would that have prevented Fable from being developed in the first place? An all-F# implementation of F# is much preferred for long-term language-independence. Otherwise F#'s existence and manifestations just becomes fundamentally dependent on Roslyn. The Fable port of the F# compiler is one great example, but Fez is another (F# to Erlang) and it's quite possible there will be others. The ideal is the FSharp.Compiler.Service.dll has no dependencies besides FSharp.Core.dll. There're two things: the Fable CLI and the Fable REPL. 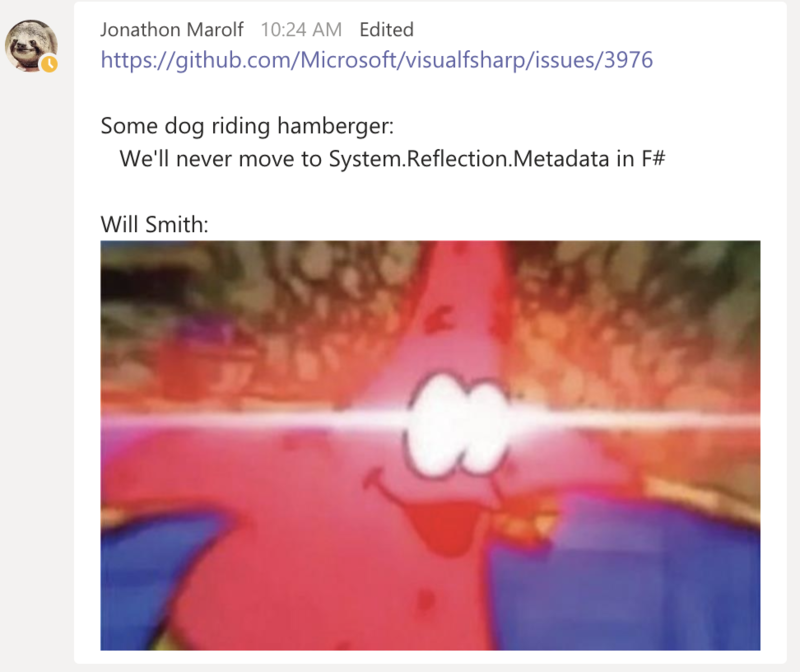 The former is still a netcore application, so it shouldn't be an issue if FCS had other .dll dependencies (though it makes everything easier if there're none), while the latter is FCS+Fable sources dogfooded into Fable CLI to create an F#-to-JS compiler that can run entirely on the browser. This would probably hadn't be possible if FCS had dependencies as @dsyme confirms. Fable can only compile source files, no dlls (that's why Fable libraries include sources in the .nupkg). This is because FCS can only provide the AST from source files. FCS still needs some of the .dlls from the BCL to read the type metadata. This is also a requirement in the Fable REPL. It was discussed if another format should be adopted, but precisely because FCS contained the code to read the binary files and Fable could compile the code to JS, the easiest option was to keep the .dll format. The only problem with this is the Fable REPL has to download around 2MB of gzipped dll files. I would like if there was way to have only the metada without the rest of the code, be it in a .dll or a different format. But it's not really a big issue. IMO the easy availability of the F# IL reader/writer makes tinkering with assemblies (e.g. exporting the BCL metadata, porting to other platforms, etc.) trivial, thus lowering the bar for entry. @alfonsogarciacaro The whole netcore 2.0 BCL metadata is less than 0.8 MB (gzipped), and FSharp.Core metadata is another 0.5 MB (gzipped). Please keep the whole compiler in pure F# (including the F# IL writer/reader), because it will allows F# to port F# to different runtimes. For example there is a port in the pipe (as I the compiler is implemented similarly to Fable) to Erlang BEAM virtual machine (https://github.com/kjnilsson/fez). I also have plans - but no time yet - to port a minimal subset to LLVM (probably on top of https://github.com/kp-tech/fshlvm). I'll close this as it's clear that we won't be moving to S.R.M. any time soon (or ever). We still have the same API as before, it's just the implementation is using SRM. It drastically simplifies the previous implementation and technically performs better. There is still work to be done, see "TODO:" in the source code. Some parts still need to read bytes manually but it's still simpler than what was there before. It will need heavy testing, but so far it can open mscorlib and .net core assemblies, as well as others. The remaining unknowns are native resources, managed resources, and pdb info (such as sequence points) as I'm not sure what to do about them yet. @TIHan @cartermp I still think this is a good idea, but others had some concerns about it (above). What’s changed since then that you’re going ahead with the change now (in spite of those concerns)? We have an approach that doesn't involve ripping things out. F# on .NET would use SRM, and there would be a configuration to not use it in other contexts, should someone decide to take on the (insanely complicated) task of doing something like porting F# to the JVM or LLVM. The primary motivations are perf and maintainability. Initial benchmarks show that it's considerably faster and uses significantly less memory. SRM is pretty highly-optimized, so that shouldn't be a surprise. Reading IL in particular is significant from a perf perspective for F# in an IDE, so there are very concrete benefits to doing this for the large majority of F# users. Initial benchmarks show that it's better in perf, but this is with a lot of caching enabled so that may have something to do with it plus we still have more work to do that could impact perf later on; though we got most of the major stuff implemented already. The primary motivation of it was to improve the codebase and as a consequence, improves perf a bit. Thus, I believe it is worth it. Yes, the concerns presented above are real in regards to Fable. I don't have a clear picture on what we need to do that could help them in this context. This type of change is to be well communicated in advance. I don't know when we will actually start trying to get this in; it will be a while, but not never. We want to improve the F# compiler and tooling. We want to make it faster and more maintainable. There is no smoking bullet to make that happen; we need to try to improve everything. This is just another step into that direction. The issue back then (not sure it still applies): memory was taken from referenced assemblies embedding large resources. Finding ways to trim resources when reading the IL into memory for compile / type checking purpose could save a great deal of space. When this code will get rearchitected, it may be worth to try to get a clear cut between the state and the querying over it that occurs later in the code, eventually those could be split for out of process cache of IL references in context of VS language service. The issue you described should be resolved due to Don's work to integrate with roslyn metadata stuff. It shouldn't always load the resources into memory today. So to be clear: What I read is that Microsoft will no longer maintain the F# version of the metadata reader and writer, but it will be handed over to the community, correct? If this is true, one additional thing to consider is that it might be hard for the community to make sure the quality of the F# version will be "on-par" with the SRM implementation. In practice, that means breaking some of the above use-cases until someone is willing to PR a bugfix and then waiting for the next release. Note: I'm not saying we shouldn't do this — just something we might need to keep in mind. Maybe we can do something about it (process wise or via some other way)? Perhaps it's a non-issue just something I wanted to bring up into the discussion.